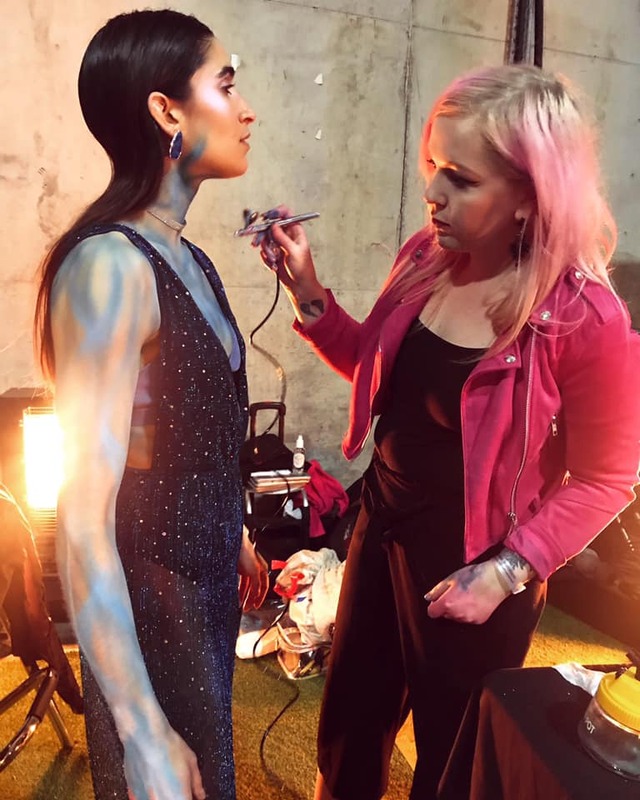 So it's a bit of an overdue blog as things have been busier than expected for this time of the year, but I just had to make sure I didn't forget to post about something that created an incredible start to my 2019 - taking body painting to The Brits 2019 at London's O2 Arena for the Calvin Harris and Dua Lipa performance! I still don't quite think the scale of it has sunk in, it was an incredibly spur of the moment job. I was so honoured to be asked to be a part of the www.make-upps.co.uk team on this job, headed by the wonderful Suzanna Forrester-Beer, alongside fellow painters Angela Youngs, Sarah Smith and Elissa Barrett.Together we worked relentlessly getting a huge amount of dancers ready in a short period of time. It all started on the day before the event, where in the afternoon I received a message from Suzanna urgently asking me to call her where she asked me if I could make it to London for 9am in the morning. Always up for anything, I think my actual response was 'erm yeah, sure!'. At this point we had no idea what the job was, just that we will be required. 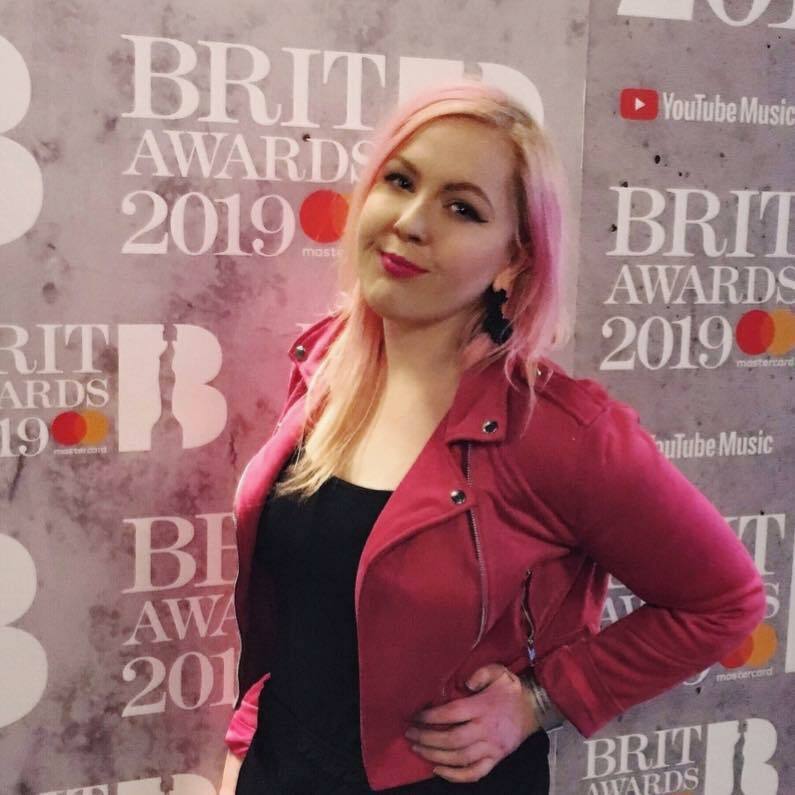 So I had a rushed evening sorting my kit out, and finally we had our booking details come about 10pm on the night, which finally confirmed we would be working with the Calvin Harris team for the performance that everyone was looking forward to most at The Brits 2019! It was a long day of waiting around, figuring out plans very much in the moment. basically upon arrival of the costumes, they didn't quite fit their planned ideas. The initial concept mood board actually had people body painted, but the costumes arrived and showed far too much skin. The only answer? Actual body paint! 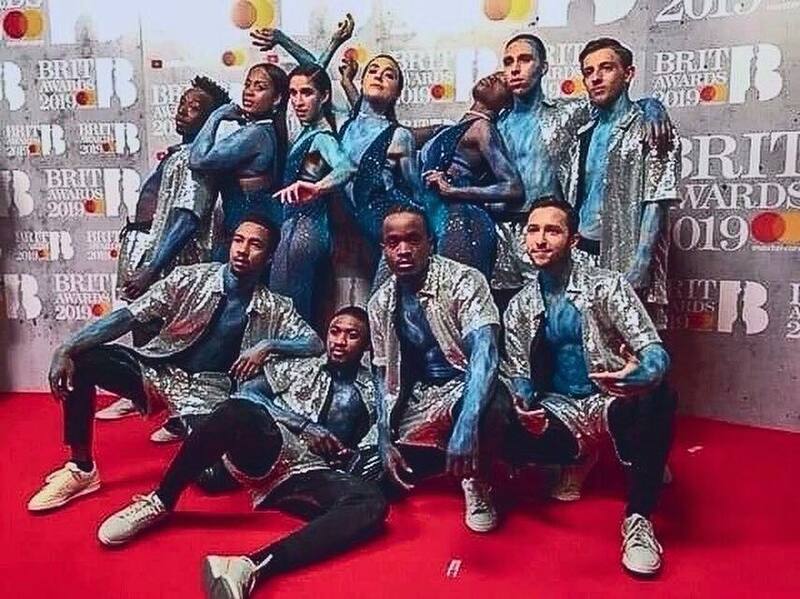 We painted a set of dancers with a water effect, as well as painting arms, hands and necks of a number of dancers wearing luminous green and pink jumpers, so they looked more like a body suit as opposed to jumpers. As always in these kind of environments, it's a very 'in the moment' kind of thing with decisions. Lots of thinking on your feet. We didn't get to see the costumes until arrival in the morning at the O2, and after talking with the creative producer, had to get ourselves set up in a little body paint corner behind the main stage (the dressing rooms weren't ventilated enough for airbrush - which meant we were colder, but in a much more thrilling position as we were amidst all the action!). We were also told, we may actual end up painting nothing! They got us there in a 'will this work?' scenario, and we had to have a play and get approval from the creative directors to decide if they actually would want to go ahead with it or not. They spend thousands of pounds on these live productions, so at the slightest hint of what we were doing not working for them, they wouldn't have used the painting. Thus is the life in these realms! But thankfully they loved what we did and it was all systems ago! As expected, there was an awful lot of waiting around, and then BAM - everyone arrives in one go. Our first dancers arrived just before dress rehearsal, and we were told 'I've got two guys for you, we've got ten minutes, that okay?'. Any one who has body painted knows how crazy two guys in ten minutes is - even with 5 of us painting! I've never seen so many airbrushes flying around at superspeed in the air at once! It was quite a thrill! We also got to watch the dress rehearsal in the main arena, which was so surreal and quite an experience to see the place all set up and empty, but we needed to see how our test dancers looked on stage and get an idea of the vision and final product. 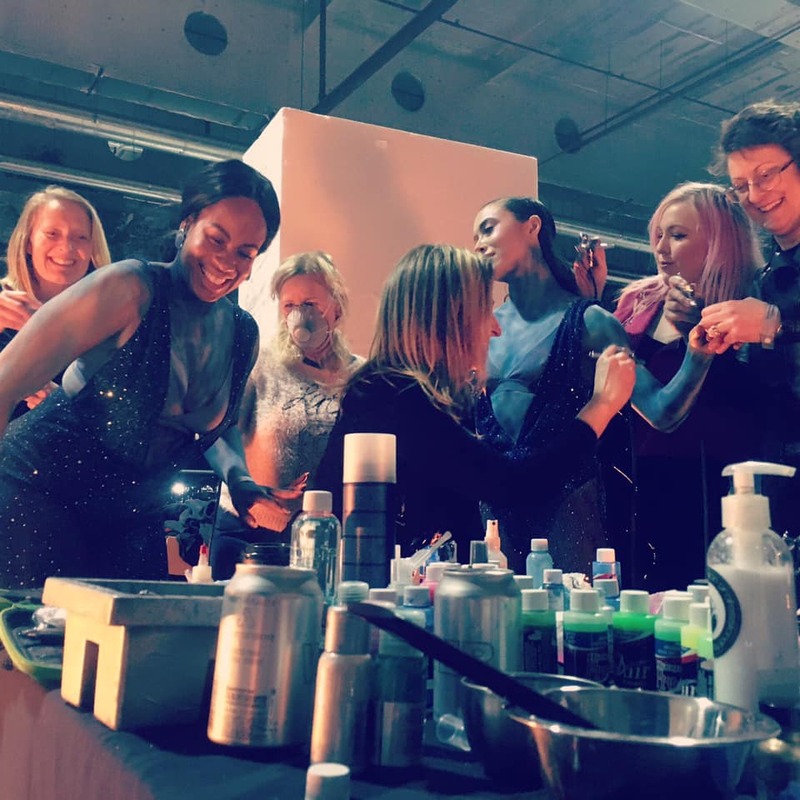 Once we had completely finished, on the evening when the Brits were live, we were allowed to go into the main arena again in the front circle to see our work come to life and perform on a stage like no other! It was absolutely incredible and emotional! Watching the performance, you may not be able to spot the body painting, but that mens we did our job correctly as it was all about blending the dancers into the background more or blending they clothes into their skin more. Not all body painting is about crazy intricate detail, and its so great to work and see this art form used in such different environments. So many thanks for Suzanna for asking me to be a part of your team. Here's the next crazy opportunity!